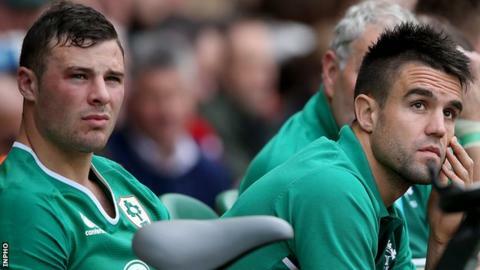 Ireland scrum-half Conor Murray and centre Robbie Henshaw have been ruled out of the last two autumn Tests because of injury. Munster half-back Murray has a neck injury and has not played since the tour of Australia in June. Leinster midfielder Henshaw hobbled off with a hamstring problem in the warm-up before the victory over Argentina in Dublin on Saturday. Ireland play New Zealand on Saturday and a week later face United States. The loss of the Lions duo is a considerable setback for Irish coach Joe Schmidt before the eagerly anticipated Aviva Stadium game against the All Blacks. New Zealand coach Steve Hansen said he expected Murray to play against the All Blacks after his side clinched a Twickenham victory over England. Schmidt had not ruled out the possibility of Murray featuring but despite the scrum-half "accelerating through his recovery", Ireland confirmed on Monday he will play no part in the final two games. Luke McGrath started as scrum-half in Ireland's win over Italy in Chicago on 3 November, while Kieran Marmion was handed the nine shirt against Argentina. Henshaw, who missed much of this year's Six Nations campaign because of injury, didn't travel for the Chicago match and withdrew minutes before Saturday's 28-17 win over the Pumas. Ulster's Will Addison was a late inclusion against the Pumas although Garry Ringrose is favourite to partner Bundee Aki in midfield should he recover from the minor injury that kept him out last Saturday.